Cardstock hand-out for the kids class at the dojo. I scanned an old calendar and converted it to vector and combined that with the foreground figure that I drew. Movie poster and a mylar ticket for the event. 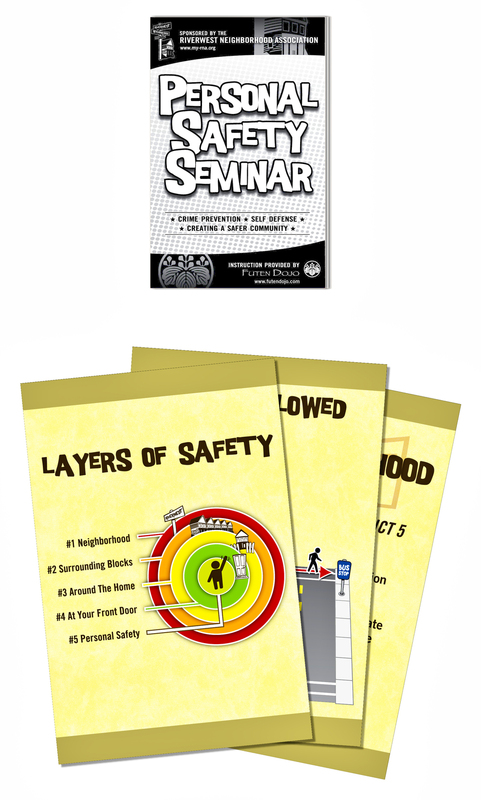 Safety seminar pamphlet and visual aids from the class. I actually arranged the class to be taught in my neighborhood, managed to get my martial arts instructor to teach it and made the print collateral to go along with it. A photo from the class. In my former life in a Rust Belt town, I studied martial arts to keep myself and others free of harm. To that end, I studied Genbukan Jujistu at Futen Dojo. Whilst there, I made graphics for use on flyers, a t-shirt, movie poster and even had the gracious help of my instructor Michael Coleman on a community personal safety class.